Folded paper program, 7 1/2 x 11 inches (15 x 11 inches unfolded), outlining the events of Macksville's three day centennial celebration. 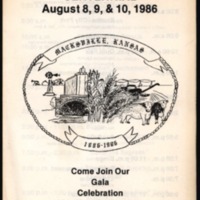 “Macksville Centennial Program- August 8,9, & 10, 1986 Come Join Our Gala Celebration ,” Digital Macksville, accessed April 22, 2019, https://macksville.digitalsckls.info/item/32. $10.00 for the weekend - Fri., Sat. & Sun. $2.00 per person - pay at the door. available all three days in the park. History Books are $20.00 and $22.00 if mailed. Folded Paper Program, 15 x 11 inches when unfolded.